For hundreds of years homes were wrapped in wood siding, as there was no viable alternative on the market. In the 1970s vinyl siding was introduced and to this day it is the most popular choice in siding Minneapolis. This energy efficient material is easy to install, easy to maintain, and will make your home the envy of the neighborhood. Aesthetically, vinyl siding can be manipulated to fit any style; it comes in a wide variety of colors, styles, and textures. Functionally, vinyl siding will greatly benefit local homeowners when it properly installed onto their homes by a Minneapolis siding professional. Krech Exteriors has a deep wealth of experience when it comes to the design and installation of high quality vinyl siding. These are just a few ways that hiring Krech Exteriors to wrap your home in vinyl siding can benefit homeowners in Minneapolis. Siding will be one of the first things visitors will notice about your home, so if it is properly installed and aesthetically pleasing your home can be the talk of the neighborhood. 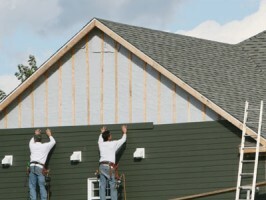 So if you think it is time to install high quality, energy efficient vinyl siding give us a call. Our skilled installation crew will be happy to hear from you. At Krech Exteriors, we’ve got you covered!